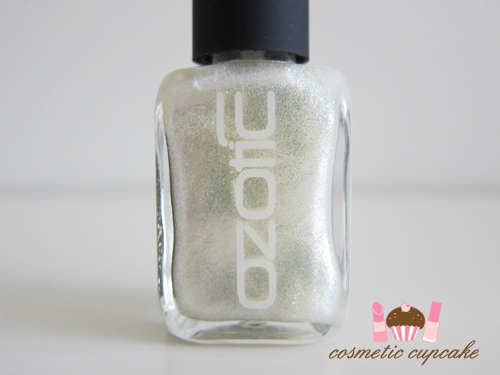 I have another awesome new Ozotic Pro polish for you today! 908 is from their new Beam collection. I love that Ozotic Pro are bringing out these new finishes! 908 is "nspired by 'reflecting luminous light beams' hence the moonlight colours with sparks!". 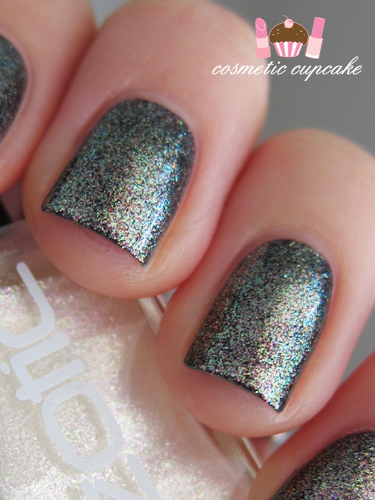 In the bottle it's pretty unassuming but OMG on the nail it absolutely comes to life! Especially when layered over a dark base it just looks amazing. It contains gorgeous white, pink, purple and green glass flecks - here I've layered a VERY thin coat over a black base. I find applying a thin coat works best for the Beam and Sugar polishes so that the it contrasts against the dark base and so you don't get any patchiness. 2 coats makes it too opaque and I like seeing the dark base through it! I haven't tried it over a light base just yet. Details: You can purchase the Ozotic Pro Beam collection from piCture pOlish for $12. Have you tried these yet? Thanks for looking as always!